In order for a group reservation to be confirmed (2-3 rooms) , a deposit of the first night of the stay including taxes is required. 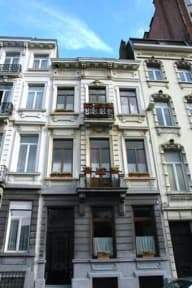 The guest house Le Lys dOr has everything for a wonderful stay in the historical centre of Brussels whatever the reason for your visit! We have the two freshly renovated, exceptionally spacious (from 25 m to 50 m!) and bright rooms originally decorated and very comfortable. 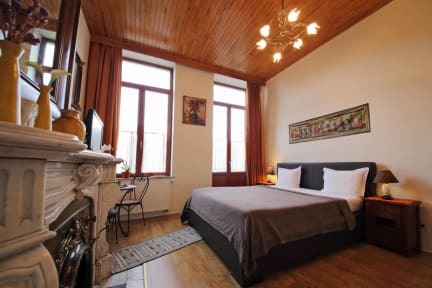 Some of the rooms are fitted with marble fireplaces and balcony overlooking the historical city. You will enjoy not only our great dcor but also our location: only 2 minutes walking away from the famous and fashionable Avenue Louise, and 3 stops away from all the European Institutions. Please note our family room (4 person room) features a double bed and a double sofa bed. From Le Lys dOr you can see the Porte de Halle Castle and the Jeu de Balle Market. City tax (3€/night ) is not included in the price. Check out by 11 am.